The Making Of "Lawrence of Arabia"
A decade before David Lean’s Oscar-winning epic "Lawrence of Arabia", John Wayne was in line to play the hero, according to a new book, The Making Of Lawrence of Arabia, launched this weekend at the Bradford Widescreen Weekend (April 26-28) by Scottish film historian Brian Hannan. In January 1953 Wayne was announced to play Lawrence in a version of the film to be made in Cinerama, the three-screen sensation of the 1950s. Although no director was set, the film was going to be produced by former journalist Lowell Thomas, the man who single-handedly invented the legend of ‘Lawrence Of Arabia’ in 1919 for a lecture tour that attracted over 5m people. 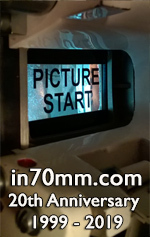 In the end the Cinerama project went the way of twenty other potential versions dating back to the 1930s, says Hannan, who is speaking at this weekend’s Bradford Widescreen Film Festival in the UK. Actors such as Richard Burton and Gregory Peck were considered for the role before it was offered to Marlon Brando, who turned it down in favour of Mutiny on the Bounty. British actor Albert Finney, recently in Skyfall, also rejected the film and the role went to Irishman Peter O’Toole. Neither was "Lawrence Of Arabia" the instant hit most people believe. The book tells how the studio was aghast to discover that a time when similar big-budget films like "Exodus" and "West Side Story" had taken advance bookings of $1m (equivalent to $10m these days) and $250,000, respectively, "Lawrence Of Arabia", two months before opening in New York could only muster $12,000, less than a third of a week’s takings. To combat this, the cinema raised ticket prices to record levels, more than doubling what previous films had charged. 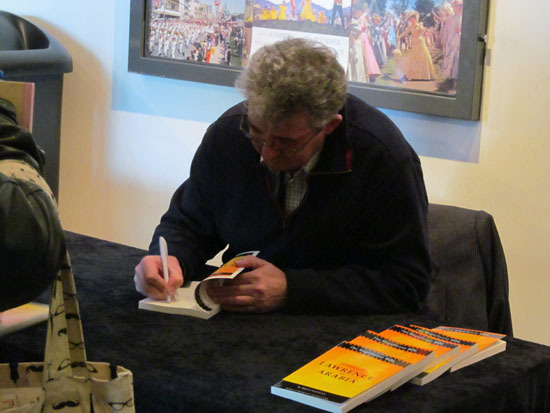 Brian Hannan signing his books "The Making of The Guns of Navarone" and "The Making of Lawrence of Arabia"
Even this was not enough to make the film number one in its opening weeks in New York and Los Angeles and in Boston it trailed in fourth, although in London it set a new record. By the end of the year in the box office annual rankings it was trumped by "Cleopatra", "How The West Was Won" and much cheaper Jack Lemmon comedy "Irma la Douce". The production went so over budget that filming was halted for over three months. Costing the equivalent today of $250m to make and market, it took over two years to turn a profit. Nor was the Oscar success a given. The US National Board of Review, a strong predictor of Oscar victory, had ranked the movie only the fourth best of the year. There was a whispering campaign against Omar Sharif and the film was in danger of being swamped by a massive backlash in Hollywood against big-budget movies which had dominated the awards for the previous six years and a whispering cam. There had even been demands that this type of film was placed in a separate category and "To Kill A Mockingbird", with a fraction of its budget and with a superlative performance by Gregory Peck, was seen as the front-runner. But in the end "Lawrence Of Arabia" was named Best Film and David Lean won his second Best Director Oscar. 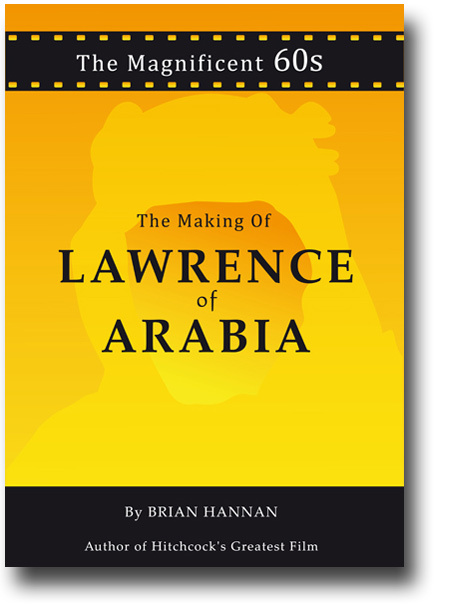 The Making Of Lawrence Of Arabia by Brian Hannan is published by Baroliant Press, priced £8.99 and is available on Kindle in the UK and in bookshops.